This was slow going but at last I have a finish in plenty of time to give as a Christmas gift for my oldest son. 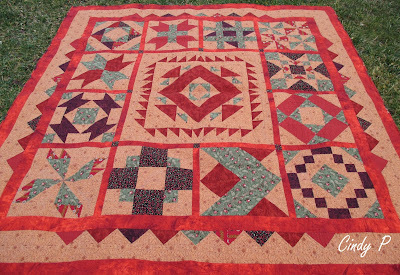 You can read about this quilt here. We have no sun which makes it hard to get good pictures. No snow either! No snow yet! But also no sun. 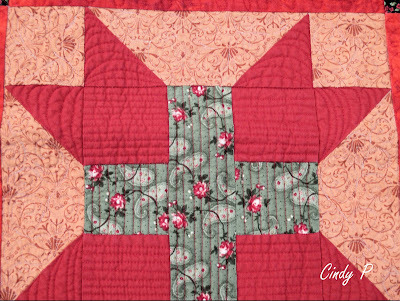 The first border I added was simply HST's with a strip of background fabric added to each end to make the border fit. Then a strip of background fabric and a final strip of the same fabric as the sashing and inner border. It finished up at 70'' but after tossing it in the washer and dryer it finishes at 67 1/2''s square. 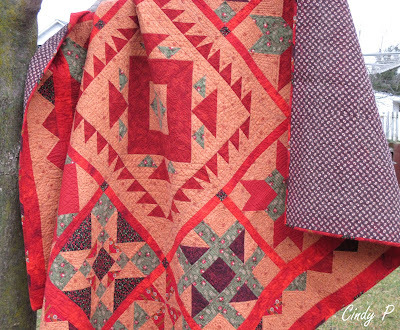 I love a quilt fresh out of the dryer showing all the texture of the quilting. I did try out some ruler work with the ruler foot toe, you can read more about the foot here. Amy from Amy's Free Motion Quilting Adventures has a Craftsy class which I have already taken,this is an affiliate link. I only have one ruler but I know I will be buying more soon. It did take a bit to get used to moving the ruler with the fabric and I have, as my one granddaughter said a couple 'hills' where the I didn't move everything together as a unit. But overall I was impressed hills and all. As you can tell it doesn't take much to get me excited. harder to see the ruler work in this one mainly the background. On top of that I have hardly any scraps from this project I made a scrappy binding, by sewing 1 1/2'' strips of all the red fabrics, together then cutting them at a 45 degree angle at 2 1/4'' for my binding width, then I sewed the cut strips together to make over 320'' of binding. I like the effect of the scrappy binding. By the way I fixed the block with the corners going the wrong way read about that here. I appliqued a new piece over each corner and quilted them. 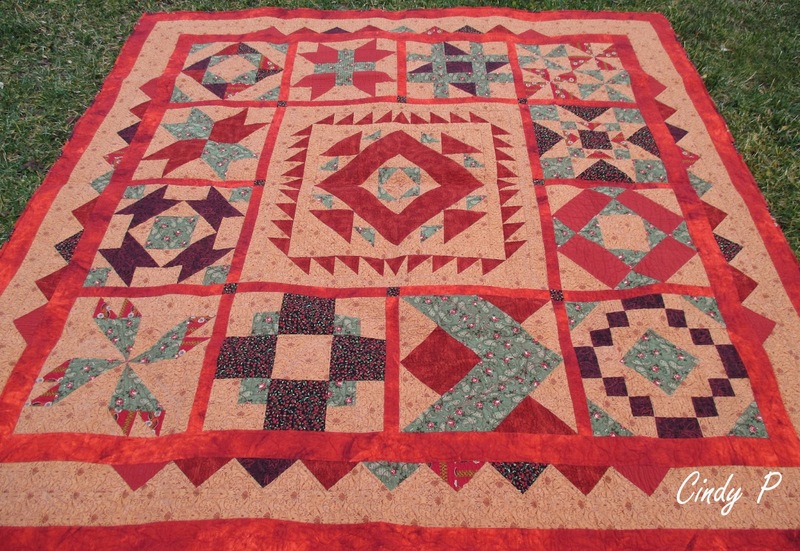 The colours in the quilt would have shown up better if Mr. Sun would have made an appearance. 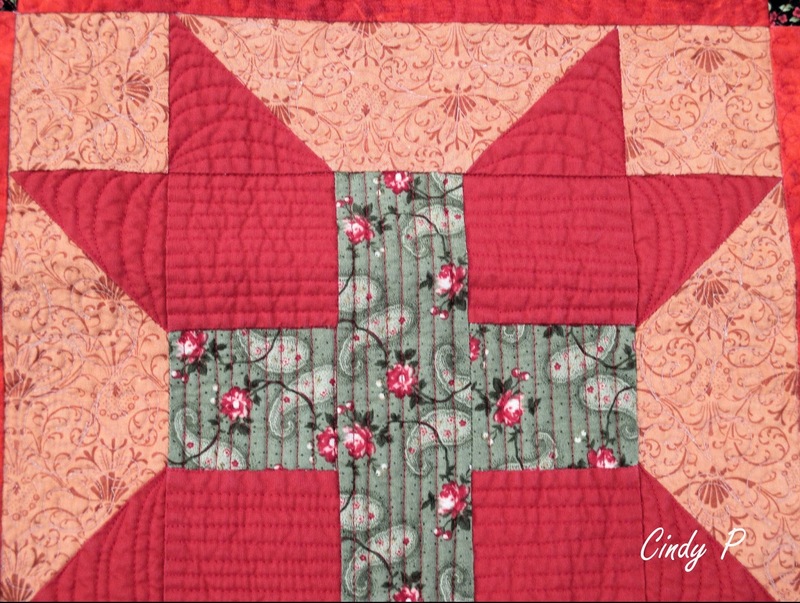 Cindy, the quilt turned out beautiful! Your son is going to love it. The appliqued HST's turned out great. I will have to remember that trick. The ruler work looks great too. Did you enjoy working with the ruler foot and rulers? I have a few rulers and have tried using them with my hopping foot, but have not broke down and purchased a ruler foot yet. 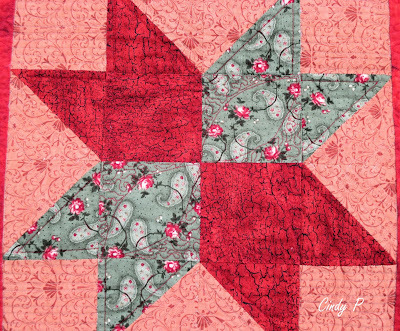 What a great finish, and I think appliqueing HSTs over the top was a great solution. I don't know that I'm ready for Christmas, but I have a feeling it will march right on by whether I am or not! 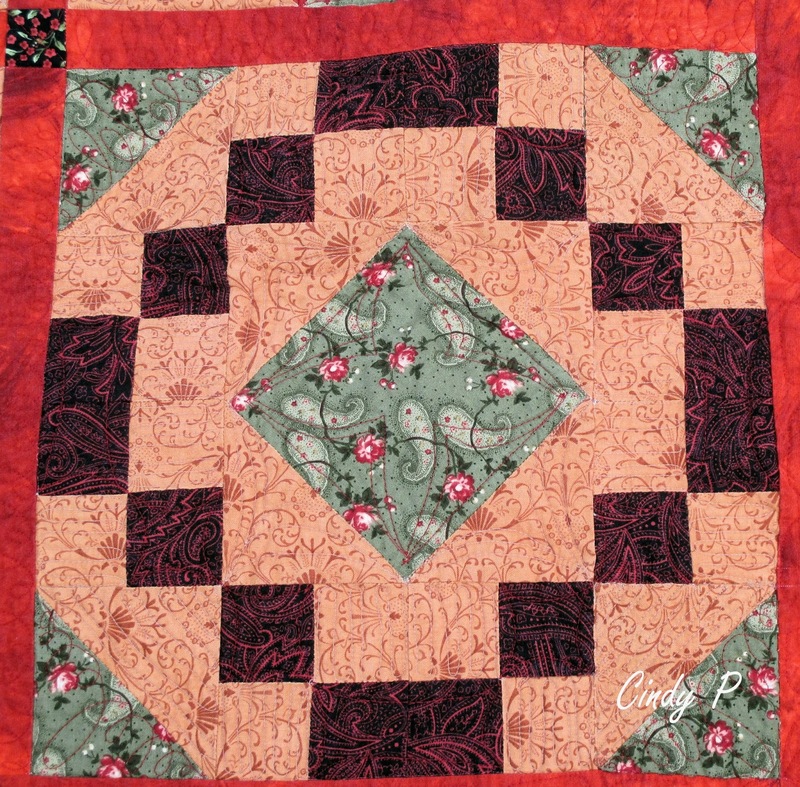 Cindy, it is a wonderful quilt! If your guild liked it half as much as I do, then it must have been a hit. 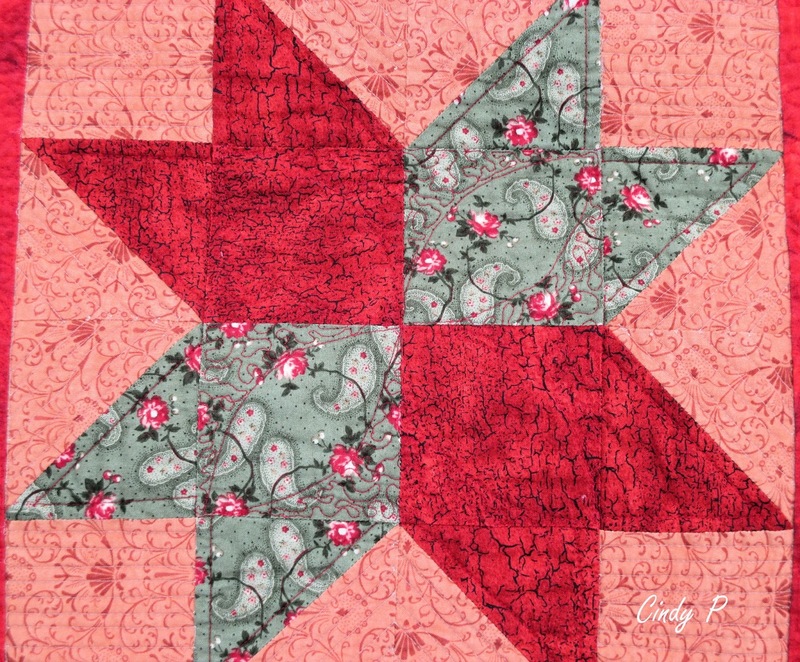 Love the texture your quilting added. And you can't even tell the one block had an oops - applique' did the trick! Nifty way to fix that flipped piecing. (Can you sleep now? : )I think someone will love this very much! It's beautiful, your son will love it. Honestly, I would have fixed it, too. It looks great! Of course you know I'm going to say how much I love the shot of your quilt in the tree!! Another crazy lady with a quilt and a (phone? camera?) You are pretty amazing to have fixed those 2 corners so very very well and then quilted them...I can just imagine in 100 years from now when someone studies it, finds it's fraying, and finds the other layer underneath!! I would probably have fixed it too, even though I do think leaving it and being slightly Amish would have been a-okay too! I love the colours, overcast skies and all. And that texture! Your ruler work is amazing, must watch Amy do this; I cannot wrap my brain around it. And well, I made another batch of baking tonight, so that's 2 things. I think I am done though, but nothing is wrapped, and the tree is still not decorated!